Stonhard Inc. processes and packages colored silica aggregate at its Ft. Wayne, IN facility. The material is part of a three-component mortar consisting of liquid epoxy resin and a liquid curing agent used for industrial and commercial flooring applications. Some 82,000 lb. of this aggregate is pneumatically conveyed from blending vessels to holding silos every day. Ceramic elbows used in the pneumatic system could not withstand the abrasive action of the silica aggregate and failed within 3 months. Stonhard considered the lost production due to elbow replacement downtime unacceptable. The plant tried sweep ceramic elbows, but they lasted only about 4 months. The company needed pipe elbows that could withstand the abrasive action so that production downtime and maintenance costs could be reduced. After considering several alternatives, Stonhard decided to accept the offer of a local distributor to try a new type of elbow "free of charge." 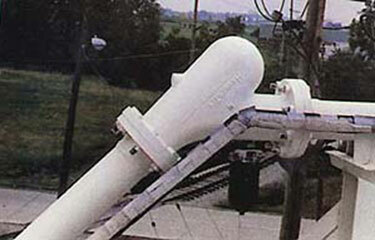 The elbow has a spherical chamber that works on an entirely different principle than most pneumatic elbows. Some of the conveyed particles form a slowly rotating ball in the chamber. Other particles of the moving material are deflected by the material suspended in the air and given off by this soft, rotating ball. Instead of worn walls, the moving material and the air take all the abuse. The material in the chamber is undamaged. This spherical mass of material is slightly off-center, so that the soft ball rotates-absorbing new material at the top and losing material at the bottom. The ball is self-renewing and the gentle deflection of the conveyed material is constant. With the ceramic elbows, the silica aggregate was deflected by the outer wall and the abrasive action destroyed the elbow. With the spherical chamber elbow, the soft rotating ball deflects the silica aggregate and eliminates the abrasive action. 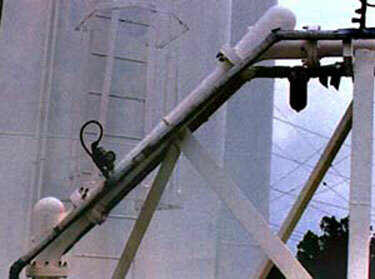 Stonhard purchased and installed two 4-inch Smart Elbow® deflection elbows in April 1985. These have been inspected several times since, and after more than 18 months of use, the amount of wear is considered insignificant. Before you spend any more on repairs and/or replacing worn-out sweeps or plug tees, talk to us about our Smart Elbow design. We have a special 60-day introductory plan (In Stock Products Only) for all new customers.